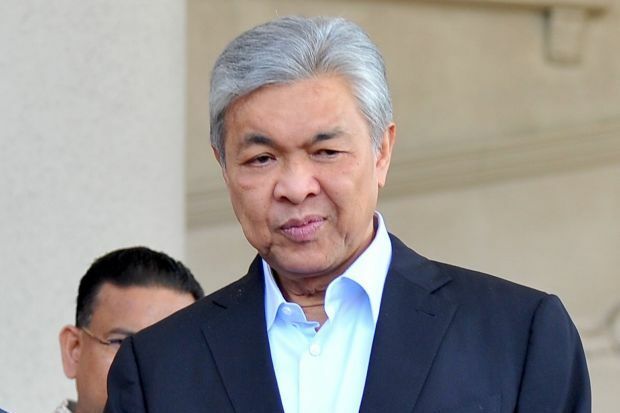 KOTA KINABALU (Bernama): Sabah Umno Youth wants party president Datuk Seri Dr Ahmad Zahid Hamid (pic) to resign from the post in order for the party to progress. This follows the mass resignation on Wednesday (Dec 12) which saw Sabah Umno’s entire liaison committee members and almost all the divisional chiefs in the state quitting the party. Sabah Umno Youth vice-chief Ghazalie Ansing said the party’s supreme council should ask Dr Ahmad Zahid to resign if he did not want to do so voluntarily. “We want Umno to be led by someone who is capable of leading this party… the uncertainty of the president in determining Umno’s direction has resulted in many party leaders and members leaving. “The president does not command respect from Umno leaders and members, and he is also seen as trying to make the party a shield to protect him against (court) cases that he is facing,” Ghazali said in a statement here on Thursday (Dec 13).